The Mark Andy Digital Series hybrid press is a unified platform which integrates flexographic printing and web transport with UV inkjet printing, in-line with product decoration and converting. 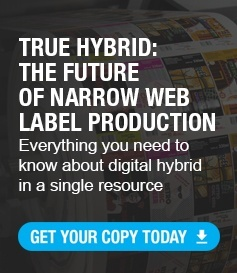 The solution is targeted to label printers looking for increased productivity, flexibility and capability not achievable from existing stand-alone flexo and/or digital assets. 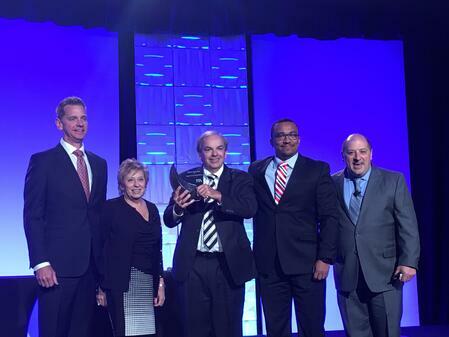 Joe Tuccitto, Director of Education, and Shelley Rubin, Manager of Educational Services, present the FTA Technical Innovation Award in the Heavy Equipment Category to Mark Andy's Steve Schulte, Ray Dickinson, and Joe Calmese. The award-winning Digital Series platform is customizable and configurable, with each configuration specific to converter requirements. In addition, the platform is modular, allowing in-line flexo modules (foil, lamination, die cutting, spot color printing, etc) to be added as needs change. This modularity also accommodates simple upgrades, allowing the technology to be updated as flexo and digital technologies evolve. This eliminates obsolescence of the technology each time a new advancement is made. The benefits of hybrid technology have inspired a growing Mark Andy digital portfolio which includes the entry-level Digital One label press introduced at Labelexpo Americas 2016, and the low-risk retrofit Digital +3600, the inaugural solution in the growing Digital Plus program supporting digital print retrofits to existing flexo equipment. With over 40 digital hybrid press sales worldwide, Mark Andy is committed to developing responsive solutions that are superior in quality, highly productive and increase profitability. The Digital Series, and a full complement of Mark Andy flexo and digital technologies, are available for live demonstrations on site at the company’s USA headquarters in Chesterfield, Missouri, as well as in the European headquarters show room in Warsaw, Poland. To schedule a demonstration, visit http://info.markandy.com/request-a-demo.